My math class is really keeping me on the ropes. But today class was canceled so i have found the time to write a post that i have been meaning to write for a very, very long time. This edition of Central Coast critters goes out to a very special gal. She is of of the biggest stars of the Central Coast you’ve never heard of. And she played a pivitol role in my quest to become a paleontologist. It all begins in 2005. A new housing development called Merridian Hills was being built in the town of Moorpark, Ventura County. 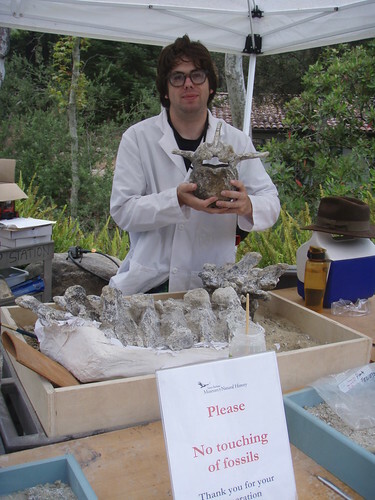 As is standard practice by California law, a paleontologist and/or archaeologist was required to monitor the site. As bulldozers and earth graders leveled the site, something caught the monitoring paleontologist’s eye. He spotted a couple patches of white and gray in the mud brown dirt in the wake of a bulldozer. He examined them and realized they were fossil bone! He marks the fossils, all 3 of them, with orange flags so the heavy equipment operators know to stay away from that spot. As he began to dig, he couldn’t believe what was turning up: the fossils turned out to be the skull, tusk, and neck vertebra of a mammoth! While the dozer had taken away 1/3 of the skull, 6 inches of tusk, and half the neck (literally half the neck. All seven vertebra were there, but each was cut in half), the fossils were still very complete! But then more of the fossil began to surface: vertebra, ribs, leg bones, arm bones, and even little toe bones. Bones of other animals were turning up as well. The paleontologist knew this was a much bigger task than he could handle. He contacted the Natural History Museum in LA for help. 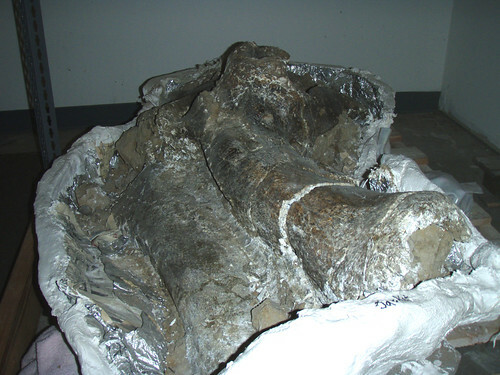 They weren’t interested, saying it was probably just another Colombian mammoth. They couldn’t have been more wrong. While the paleontologist was trying to find people to help excavate a whole mammoth skeleton, he examined one of the teeth. It was a typical mammoth tooth, with the cemented ridges of enamel designed to chew grass. But something wasn’t right. In addition to the ridges, there were several bumps mixed in. And then the paleontologist realized this wasn’t a columbian mammoth. It was an older and much rarer American beast: a southern mammoth! Excavation of the "Moorpark Mammoth"
The paleontologist managed to find a small freelance fossil company to help dig the specimen out. After she was out of the ground she was put into storage. The company had dome some prep work and microfossil screening, but little else. It seemed that this magnificent fossil was doomed to spend her days in obscurity in some random Moorpark facility. But then in 2007, two years after her great bones were pried from the earth, a miracle happened. The city board, who had come to nickname the fossil Emma, voted to donate the specimens to the Santa Barbara Museum of Natural History. The museum excepted, and against the odds Emma was given a second chance. I had actually stumbled upon Emma by accident. In December 2007 i was visiting the museum and, as usual, drooling over the fossils in the paleontology hall. I noticed a couple display new and empty display cases. Then a few men, one of whom i recognized as Paul Collins (curator of vertebrate zoology), wheeled in a cart loaded with fossils. There was an articulated hand, an articulated lower back leg, a vertebra, and a mammoth’s characteristic molar. I made some brief chat with the museum staff wherein they explained that these fossils were found in Moorpark in 2005 and had recently been acquired by the museum. He also explained they were going to have a prep lab that summer to prepare the bones. And what do you think happened? I volunteered that summer and spent one day a week prepping not just any fossil, but a very unique one. Boy do i look dorky! No i didn’t dress like that every time! But overall i spent a total of 55 hours pepping a mammoth that summer. And it felt fantastic! Long before i had the tools to combat my depression, this gig gave me such a boost in confidence, self-esteem, and self worth. I was proud to tell people what i was doing. I felt like i was actually contributing to the paleontological community as well as help my favorite museum. I was even quoted in a Ventura newspaper as saying “You wait your whole life for an opportunity like this”. But all good things must end, and at summer’s end the prep lab was closed up. I tried to continue doing volunteer prep work, but Paul said they had a guy coming in once a week to do that. And ever since then, i have been trying to experience the high i had that summer. But i have failed for the most part. The sense of pride, achievement, joy, fulfillment… I was exercising my passion, living it, doing what i waited my whole life to do. All efforts to get back in the game from then on failed, only fueling the despair and darkness that plagued my being. I remembered fondly that summer and the work i did, only then weep for what i had lost.I’m better now, but my efforts to get into the paleontological community have been fleeting at best. But back to the heart of the matter: why is Emma such a big deal? Well for starters, she’s a southern mammoth. The southern mammoth (Mammuthus meridionalis) is well known from Eurasia but is much rarer in North America. The southern mammoth is presumed to have been the first mammoth in North America, crossing over from Asia about 1.5 million years ago. I don’t know of many southern mammoth fossils found in North America, but oddly enough the ones i do know all come California. 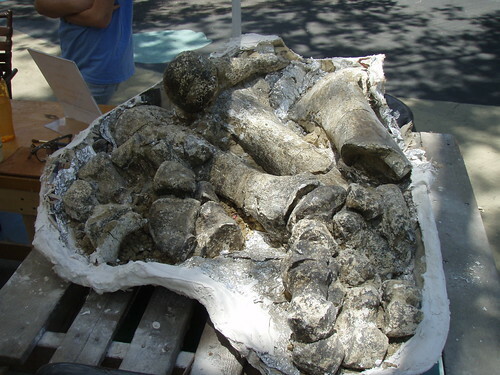 Southern mammoth fossils have been found in Victorville, Anza Borrego State Park, and Moorpark. Plus Emma has the potential to be the most complete southern mammoth in North America. The current record holder is a specimen held in the Smithsonian; a large female discovered in Anza Borrego in the 1970s, is about 70% complete. Emma could be a contender, but until an official bone count is done, we won’t know for sure. Emma's feet and hind limb bones in a big fossil log jam! Emma is also significant for her age. Based on an index fossil known as Meade’s Pine Mouse, the site was dated to around 750,000 years ago. A lot of fossil sites in California, especially on the coast, tend to be late Pleistocene, 40,000 to 10,000 years old. Emma’s site is from the middle Pleistocene, a less well understood time period. But the mice weren’t the only fossils found there. Fossils of the Western Horse (Equus occidentalis, though since i don’t know what was found i don’t know how concrete the identification is), llama, and mastodon (a pair of mastodon tusks were found across the road from the construction site, but i don’t know if they are from the same layer). This fossil assemblage is important because it’s another piece of the puzzle of life in the middle Pleistocene. The age of the site is roughly the same as the Fairmead Landfill, so we can make a comparison and perhaps better understand Emma’s site. Finally, Emma is important because of where she is from. The Central Coast, as i try to show through this blog, has a surprising rich fossil history. And i have all too much lamented, much of that amazing history is locked up, out of sight, out of reach, in museum to the north and south of the Central Coast. But that such a valuable and spectacular specimen remained on the Central Coast, in a place where she will be appreciated and treasured, is a great victory indeed. Emma has come a long way as it is, to be stuffed into the echoing vaults of a larger museum would be tragic. Like most other fossils on the Central Coast, her story should be told and shared with the world. If only more fossils from the Central Coast (like the fossilized whale brains or Avila’s giant sea cow) were as lucky as Emma. Someday, when the museum has the space, she will become the centerpiece of a revamped paleontology hall. Over the years i have sent them various ideas for such a hall. They said they appreciated them and would keep them in mind. I think i hinted in an earlier post that perhaps instead of trying to start my own museum i should help an existing one. Well I can think of no one better than the Santa Barbara Museum of Natural History. They already deal in all things Central Coast. Plus, they don’t have a paleontology curator; their small fossil collection is looked after by Paul Collins, who you can imagine is more interested in modern faunas. I recently tried to get a BLM permit to search the Caliente formation for fossils. The museum director appreciated the offer, but turned me down because they have neither the curator nor the storage space to accommodate what could be a new stream of fossils. I have always thought that if i were ever lucky enough to join up with SBMNH that the main museum could display Central Coast fossils while an offsite facility (like the Sea Center) could deal with the stuff from further abroad. It’s an unrealistic thought, much like the Grand Vision. But hey, if a rare fossil can be uncovered by a bulldozer and then remain in it’s homeland, then why can’t i join up with a kickass Central Coast museum and help them share the wonders of the ancient world with our moern one.